Now that we’re more than halfway through 2016, how much closer are you to your body goals? Perhaps your dream body might still feel like a faraway, unattainable goal, but here’s the good news – it’s not completely out of your reach. So stop dreaming, and start taking action to get the body you desire! One of the best ways to lose fat is to lead an active lifestyle. Ideally, you should keep active and engage in physical activity at least three times a week. It helps to choose an activity you enjoy – be it martial arts, HIIT, running, or swimming – so that you’d be motivated to stay consistent. Also, if you don’t already know, strength training helps with burning fat! This is all thanks to the muscles you build when you do so. When your body has more muscles, it will work harder so as to keep your muscles healthy and enable them to function well! As a result, you’ll burn more calories even at rest. If you’d rather work out in the comfort of your home, then try thisultimate body sculpting workout! The only equipment you’ll need is a pull up bar, which you can easily install at your doorway. It is important to drink at least 8 glasses of water daily. Yes, we know. Happy hour is probably the highlight of a dreary Monday, or perhaps your favorite way to TGIF, but here’s the thing: alcohol prevents you from burning fat. (Even if you’re already leading a very active lifestyle!) Apart from filling your body with empty calories, alcohol also produces acetate – which is a substance that encourages your body to store fat. Eek! If you’re serious about getting rid of unwanted body fat, your best substitute for alcohol would be plain water. Think about it. You’d be replacing all those empty calories with calorie-free water. Besides that, water also keeps you hydrated and enables your body to flush out toxins. 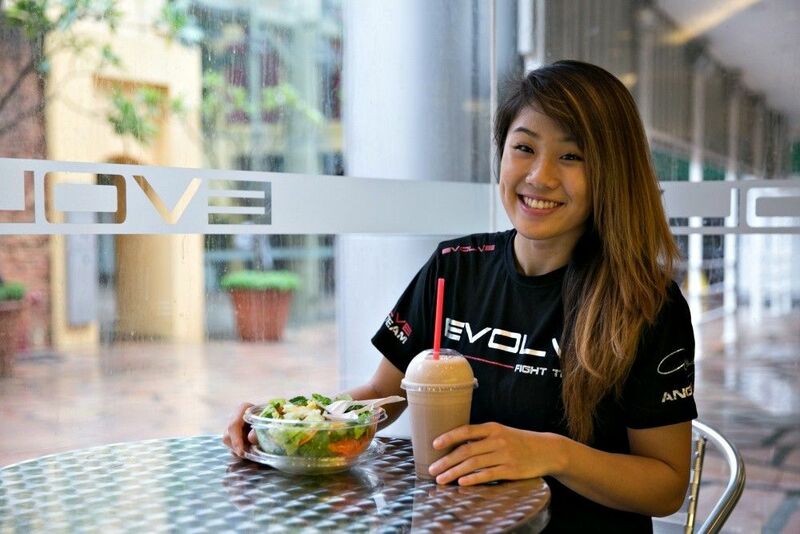 ONE Atomweight World Champion Angela Lee enjoys her salad and smoothie after a hard day of training! When it comes to empty calories, alcohol isn’t the only culprit. Empty calories also come in the form of your favorite snacks and fast food. While it might be difficult to give up your favorite junk food, believe us when we say it’s worth it in the long run – especially when it concerns your health, and of course, shedding fat. With that said, you don’t have to eliminate it completely if you really can’t bear to. After all, it’s okay to have a cheat meal every now and then. Just make sure it doesn’t spiral out of control and turn into a cheat day, week or month! Ideally, you should include more fresh veggies and fruits in your diet if you want to melt away fat. This is because they are rich in fiber (which can keep you full on fewer calories!) and contain loads of nutrients and vitamins. When you treat your body well by increasing your intake of fruits and veggies, you’d be filling your stomach with foods that love you back. So aim to have 5 servings of fruits and veggies daily! We believe that those who fail to plan, plan to fail. That’s why it’s crucial to make plans so that you’d be more motivated to take action and establish a routine, as well as keep tabs on your progress. We suggest listing out your meal and exercise plans – be it in a journal or on your phone – so that you’d have something you can refer to anytime! These habits do more than just melt away unwanted fat – they also improve your overall health and help you get into the best shape of your life. So keep this in mind especially during the moments when you don’t see visible results and get impatient or start feeling unmotivated. It also helps to remember that progress is way more important than perfection, so celebrate every victory – no matter how tiny it may seem. After all, small steps can lead to big things!